Text "What size book would you want to carry?" 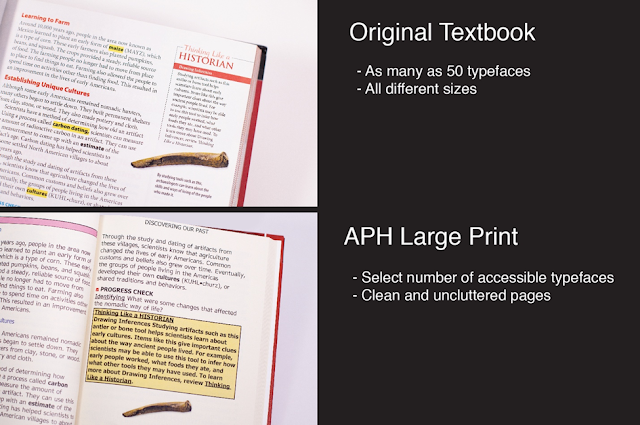 Below that shows the average size textbook which is the same size as the APH Large Print compared to the larger APH Traditional Enlargement textbook. At its basic level, the APH Traditional Enlargement is just taking a textbook, putting it on a scanner and then stretching it to be larger. At its best, this can increase the text to about 14 points, but most times only 12 points or smaller. This makes the book really big, with 11.5 x 14inch pages, and often the images are distorted because they are stretched beyond their original resolution. A standard textbook can have up to 60 different typefaces. In this textbook process, these all remain, they’re just bigger. APH Large Print is all about optimal readability. 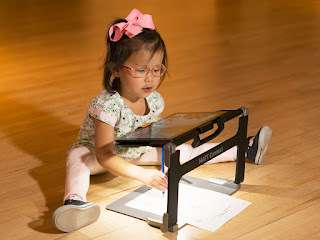 We use a specialized process, coupled with field tested designs and specifications that make our textbooks perfect for a reader who has low vision. The final result is a book with only a few different accessible typefaces, a new layout, and full resolution large text. The improved layout is printed on standard size textbook pages. This means the textbook comes in volumes, but they are the same dimensions as the books their peers use. All APH Large Print textbooks are available in a digital download from the APH File Repository making the books even more accessible. Not only do students like APH Large Print better, but it creates a better, barrier free learning environment. Text reads "Original 8.5 x 11 inches; APH Large Print 8.5 x 11 inches; APH Traditional Enlargement 11.5 x 14 inches"
Two images comparing original textbook page to APH Large Print page. Text reads "Original Textbook: -As many as 50 typefaces -All different sizes; APH Large Print: -Select number of accessible typefaces -Clean and uncluttered pages"
The phase out of Traditional Enlargement will happen slowly. To make sure you don’t get caught unaware, below is a detailed schedule of what will be happening and when it will happen. The schedule has been spaced out to accommodate your needs and make the full adoption of APH Large Print a smooth transition for everyone. Jan. 31, 2019- We will be removing all Large Print and Enlarged Print textbooks 10 years or older with low sales from our collection. The removal of these titles should affect very few people and help eliminate out of date information (health, science, technology). These books will also be removed from the Louis Database. For anyone that would like to order one of these textbooks, a list of these titles will become available soon. Sept. 30, 2019- We will no longer accept new textbook titles for the APH Traditional Enlargement process. Textbooks released from that date on will only be available in APH Large Print and digital options. Sept. 30, 2021- We will cease reprinting all APH Traditional Enlargement textbooks. The removal of the APH Traditional Enlargement process and the renewed focus on APH Large Print books will help us create the most comprehensive and accessible collection of textbooks for K-12 students produced in the United States.